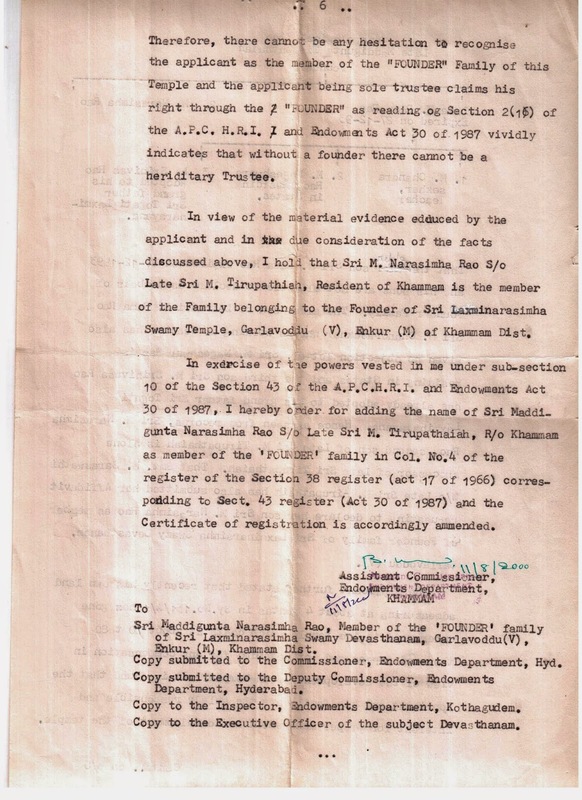 SRI LAKSHMI NARASIMHA SWAMY TEMPLE GARLAVODDU,FOUNDER TRUSTEEi.e FOUNDER FAMILY MEMBER RECOGNITION ORDER VIDE IN PROCEEDINGS IN R.DIS..No.C/2966/96 DATED 11-08-2000 IN FAVOUYR OF SRI MADDIGUNTA NARASIMHA RAO S/O LATE THIRUPATAIAH. 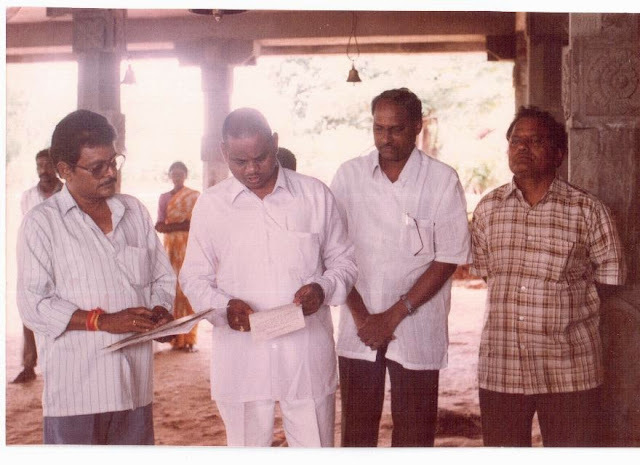 ADMINISTERING OATH ON31-08-2000 IN THE TEMPLE PREMISES. The Lakshmi Narasimha Swamy Temple , Garlavoddu is the one of the famous Temple inKhammam District, Telangana State of India. 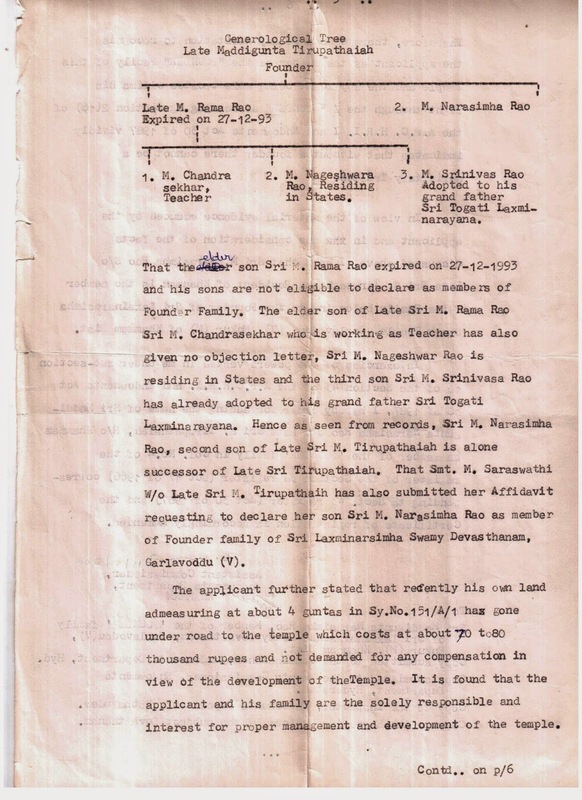 Garlavoddu Temple is under the managemeni Sri Maddigunta Narasimha Rao S/o. Thirupataiah, who has been recognised as Founder Trustee by the the then Andra pradesh Endowment Department. 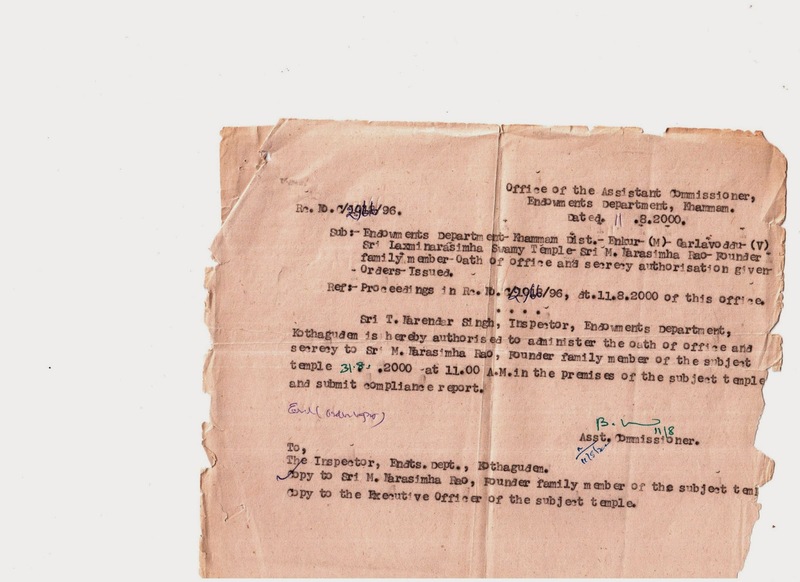 On 11-8-2000 The proceedings Orders in R.Dis No. 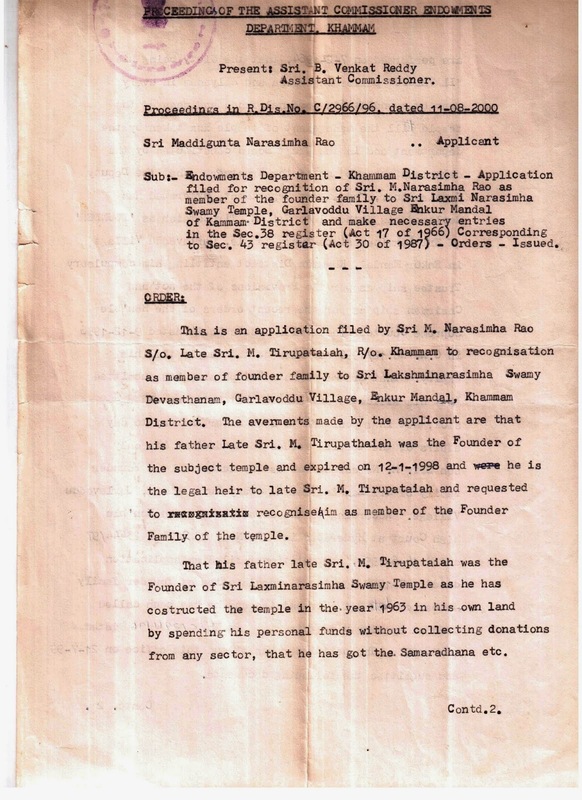 c/2966/96 has been issued in Favour of Sri Maddigunta Narasimha Rao and he taken oath on 31-8-2000 as Founder Trustee /family member of the Temple. 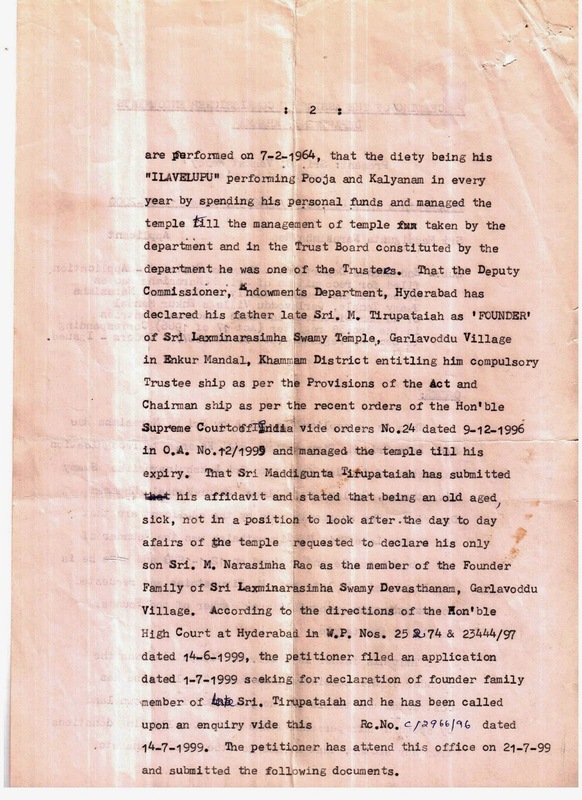 Since that day till date he has been working as such under his management The Temple has been well developed. 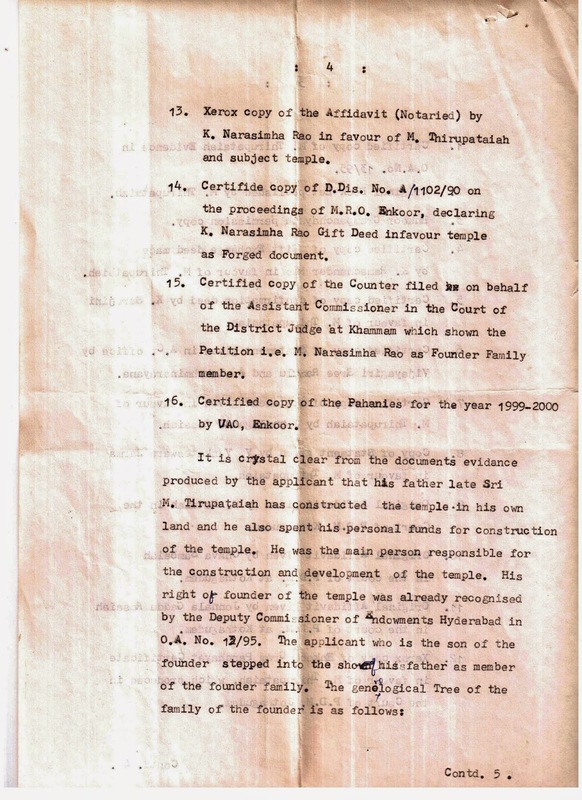 The Following images related to Sri Maddigunta Narasimha Rao's Founder Trustee Order Copy, and his oath administration. 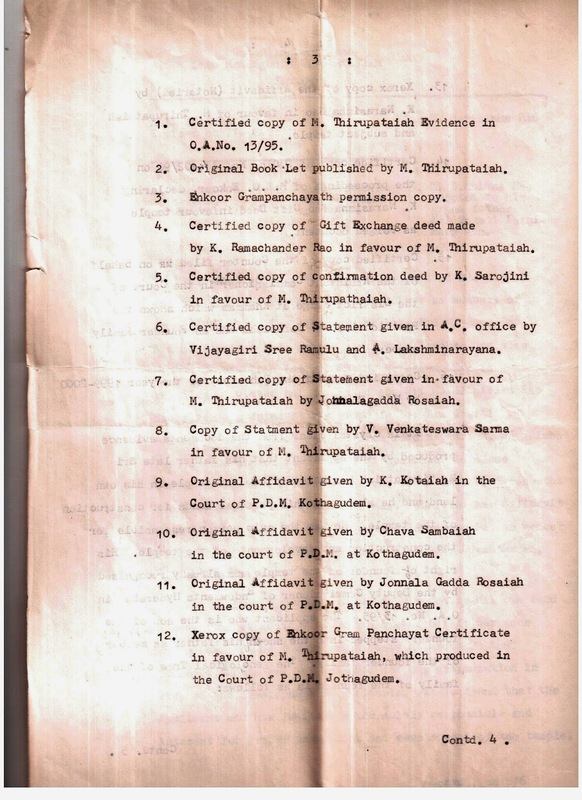 ORDER COPY IN PROCEEDINGS IN R.DIS.No C/2966/96 DATED. 11-08-2000. 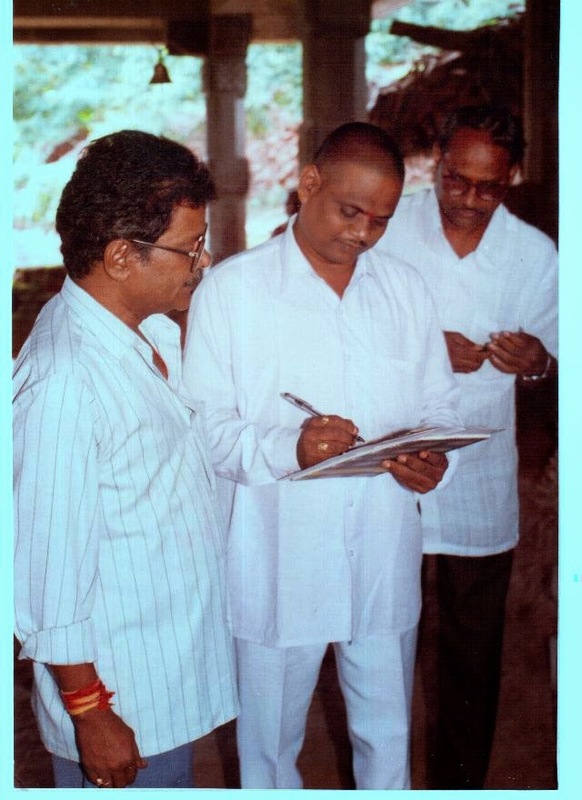 AUTHORISATION TO ADMINISTER OATH OF FOUNDER TRUSTEE OFFICE. 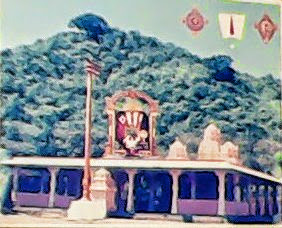 SRI LAKSHMI NARASIMHA SWAMY TEMPLE GARLAVODDU (V),ENKOOR(M),KHAMMAM Dist. A.P. INDIA.